frankly my dear...: Now it's her turn. 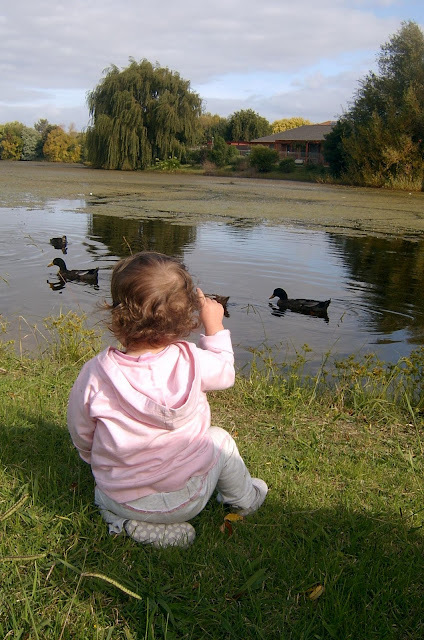 I used to often walk the other two to this nearby lake when they were this little to feed the ducks (now they can ride their bikes), it's Scarlett's turn to get in the pram now with some crusts for the duckies. She was fas﻿cinated with the 'bubbas' (everything is a bubba - dogs, cats, birds, dolls....). Check out those little curls, aren't they gorgeous?